The 2018 Alaska primary is now behind us, although a few of the races are too close to call and will be decided by absentee and early votes. It was another abysmally low turnout election, just under 20%. Most of the contested primaries went as most of us thought they would, but there were some that surprised everyone. I want to thank the Anchorage Daily News for partnering with us to make Election Central possible this year. I also want to thank everyone who either attended Election Central or watched on our Facebook Live stream. We all had a great time. And a special shout out to KONR for broadcasting everything on the radio and DJ Bald Monk for that awesome house music. We plan on doing another Election Central for the general election. More to follow on that. Landmine staff made primary predictions for all of the contested primaries. We got most of them right but we got a few way wrong. Here they are. The Republican primary in Senate District O between incumbent Senator Peter Micciche (R – Soldotna) and challenger Ron Gillham was one of the biggest surprises of this election. Gillham is currently up 9 votes over Micciche with over 5,000 votes cast. This one will be decided by absentee and early votes and Micciche may very well end up winning. But the fact that the Senate Majority Leader lost on election night to a guy who only raised under $8,000 is shocking. It’s hard to say why but it probably had something to do with Miccche’s vote on SB 26, the permanent fund restructuring bill. We called this one for Micciche but we were way off. The Republican primary in House District 15 was, by far, the most shocking race of this election. Incumbent Gabrielle LeDoux (R – Anchorage) faced challenger and newcomer Aaron Weaver, a former cameramen for KTUU. Weaver is currently up by three vote with less than 600 votes cast. This one will also be decided by absentee and early votes. LeDoux will likely come out ahead as she has always done well with absentees, but the result is shocking. LeDoux is a prolific campaigner and fundraiser. Weaver raised less than $3,000 and his last contribution was on May 2. To my knowledge he did almost zero campaigning. Word is he went to bed at 9:30 pm on election night and was awoken by a barrage of calls and messages when the results started coming in. LeDoux has faced scrutiny and attacks from Alaska Republican Party Chairman Tuckerman Babcock for joining with Democrats to form the House Majority. It’s hard to say if that is the reason for the result but regardless of the reason, it’s a shocking result. We were WAY OFF on this one. 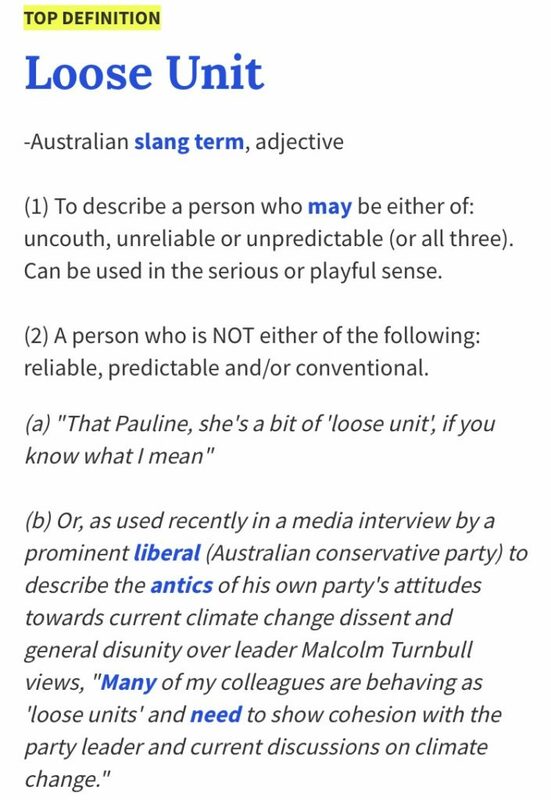 Thanks to this race I have come up with a new term. It’s called getting Weavered. Getting Weavered means an incumbent loses on election night to a person who has not campaigned at all, and who also went to sleep before the results came in because they thought they had zero chance of winning. My opponent is a Loose Unit but I better campaign so I don’t get Weavered. The Republican primary in Senate District E between incumbent Senator Mike Shower (R – Wasilla) and challenger Randall Kowalke was a blow out. Shower is up 67% to Kowalke’s 32%. Shower was appointed to the seat earlier this year after Mike Dunleavy resigned. If you recall, the process to replace Dunleavy was something else. Kowalke was appointed to the seat first by Governor Bill Walker (I – Alaska) but Senate Republicans rejected him. Shower was then appointed and confirmed, but chose to not join the Republican majority in the senate. Kowalke currently serves on the Mat-Su Borough Assembly. We called this one a tossup but the voters in the Valley clearly like the fighter pilot. The Democratic primary for District 20, the Downtown Anchorage seat that Representative Les Gara (D – Anchorage) is retiring from was a hard one to call. Zack Fields, Cliff Groh, and Elias Rojas all had things going for them. Fields had Gara’s endorsement, Groh put a lot of his own money in the race and was surging at the end, and Rojas had Senator Tom Begch’s (D – Anchorage) endorsement. In the end, Fields got almost 50% of the vote in the three-way primary. I just hope Fields takes it easy on the Aussies. The Republican primary in House District 22 was also surprising. The incumbent is Representative Jason Grenn (I – Anchorage) so the Republican primary was open. Newcomer Sara Rasmussen faced former Representative Liz Vazquez. Rasmussen was outraised by Vazquez. Vazquez is also the former rep that Grenn defeated two years ago. Vazquez’s money and name ID led us to believe she had the advantage. We were wrong. Rasmussen handedly defeated Vazquez. This is likely due to Rasmussen’s work at the door and the fact that voters are done with Vazquez, who is a bit of a Loose Unit. Rasmussen will face Grenn, and everyone’s favorite perennial candidate Dustin Darden (who is running as a Democrat), in November. The Republican primary in House District 23 was another open primary. Representative Chris Tuck (D -Anchorage) is the incumbent. Forrest McDonald faced newcomer Connie! Dougherty. McDonald ran as a Democrat against Senator Natasha von Imhof (R – Anchorage) in 2016. Not long after his loss, he switched parties and became a Republican. Connie! is a newcomer. She is running as a business owner who is frustrated with Tuck. Due to McDonald’s work at the door and having run before, we thought he had the advantage. We were wrong. Dougherty will face Tuck, who has represented the district since 2008 and is a hard campaigner, in November. 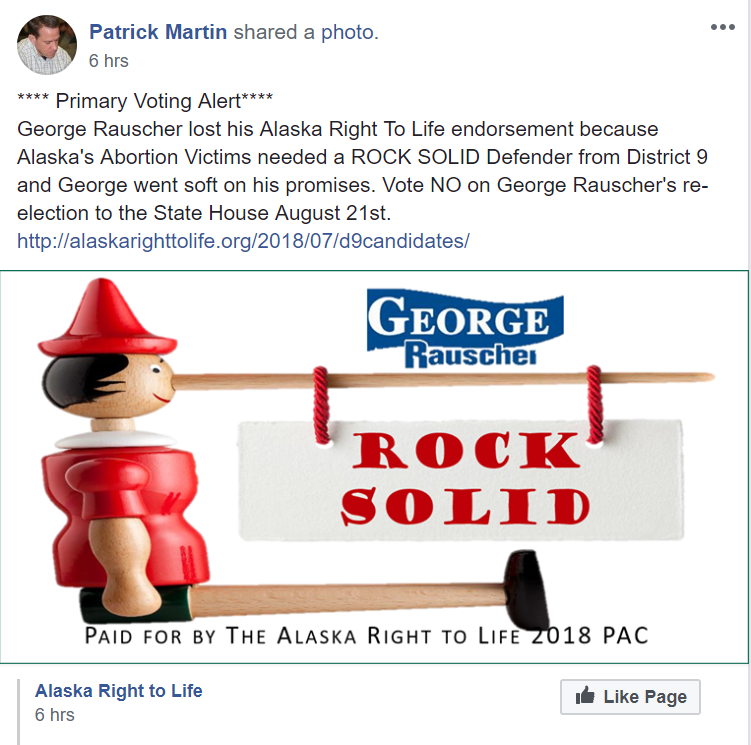 The Republican primary in District 26, the South Anchorage seat that Representative Chris Birch (R – Anchorage) is vacating to run for the senate seat, was one of the weirder races this election. Albert Fogle, Joe Riggs, and Laddie Shaw all campaigned hard and raised money. But some drama between Fogle and Riggs dominated the race. First, a video of Fogle taking down a Ross Bieling (thank god he lost) sign that was illegally placed on his property by Bieling came out. It was filmed by Riggs. I’m sure it was a coincidence… Then, a last minute mailer from Riggs came out attacking Fogle’s family and Fogle for being gay. We figured Shaw would benefit from the Fogle/Riggs drama, and he did. Shaw got almost 45% of the vote in the three-way race. One thing we all learned is that Joe Riggs will do anything to win an election, even disgusting and despicable things. Bye-bye, Joe. The Republican primary in House District 25 between Representative Charisse Millett (R – Anchorage) and newcomer Josh Revak surprised a lot of people. Revak beat Millett by 15 points! Millett is the current House Minority Leader, former House Majority Leader, and a ten year incumbent. Revak served in the Army in Iraq and was awarded a Purple Heart for a serious injury on his second tour. He then worked for Senator Dan Sullivan (R – Alaska) and Congressman Don Young (R – Alaska) on veterans issues. Millett was nearly defeated in the 2016 general election, beating Democrat Pat Higgins by only 73 votes. Revak filed right before the filing deadline. He worked hard and was able to raise money. He will face Pat Higgins in November. Full disclosure, I am the Chair of an independent expenditure group, Let’s Back Revak, that was supporting Revak in his race. No one is happier, well maybe besides Revak, about his victory than me. This is one of those weeks where the winner is clear. This week’s Loose Unit is Mead Treadwell. He earned the designation for an appearance he made on our panel at Election Central. I want to start off by saying I know what it’s like to lose an election. It’s hard. A lot of hard work comes down to one night. That being said, there are ways to lose and ways not to. Mead demonstrated how not to lose on Tuesday night. It all started when he walked into Election Central with his supporters. We were live and had Eileen Patterson, who is running as a Democrat for the Palmer house seat, on the panel. Mead came in hot and took Eileen’s place. To give some context, when Walker and his supporters came in, he worked the room for a bit and then worked with our people to setup a proper interview. Mead’s interview started off normal enough, but then got real loose. Towards the end he said, “I’m not going to blame anybody but myself.” It was something else. Classic Loose Unit behavior. At one point he also said, “I’m not bitter.” My only regret from all of that was not pointing out to Mead that he got into the race late, with full knowledge of the Dunleavy PAC, and asking if he really thought all the people he blamed were responsible for a 30 point loss. The whole thing was weird and extremely awkward. And VERY loose! You can see the whole thing here, start at 3:15:30. Oh, and for a bonus Loose Unit check out what this Mead supporter was screaming at me at the end of the interview. IDIOT! Very loose. I think old mate might have had one too many. I only wish the camera was on to catch what he said to me after. Talk about a Loose Unit!